Joey Launceford, Zach Wolfe, Sean Burke, and Len Skubal at Rifrullo Cafe. Nearly two years ago, a trio of walk-on Boston College football players showed up for a month of pre-season practice in the hot August sun. Between morning and afternoon practices, they would get a break of about three hours, time that most teammates used to take a nap. Jake Wilhelm, Zach Wolfe, Sean Burke, Joey Launceford. Celebrating National Coffee Day at Render Coffee in Back Bay. They looked for another way to boost their energy levels. They went in search of coffee. It started with daily trips to Dunkin Donuts. Eventually their journey grew more adventurous. They also took a name (Coffee Crew) and developed a wild story about the crew’s origins (it involves their ancestors running into a burning building on the Chestnut Hill campus to save a coffee maker). Their goal was to visit as many coffee shops as they could. So far they’re up to about 30. Yes, over time, their coffee tastes have evolved a little. But even more, they’ve realized that they’ve experienced Boston in a way they wouldn’t have otherwise. They’ve bonded over a coffee ritual that has become one of the most indelible memories of their college years. They began bringing along a guest each week. If you had a car, you had a better shot at being a guest. If the crew had no access to a car — and often they didn’t — they’d ride wherever the MBTA could take them. On their way back, they’d find the closest fast food joint and grab a couple of burgers for one of the members, Sean Burke (who is a linebacker). Since starting, the Coffee Crew has added another member. In addition to Launceford and Burke, it includes Jake Wilhelm (kicker) and Zach Wolfe (defensive back). Each week, they research where to go, using a mixture of Yelp, blogs, instagram, and personal recommendations. They aren’t that picky about the spot. It doesn’t have to be a trendy cafe. Just a place that serves coffee. Launceford usually gets black drip coffee, so he can compare the same drink everywhere, and he takes a coffee sleeve from each spot as a souvenir. Others in the group go with a latte or cappuccino. Sometimes they get food, but rarely. They stay for about an hour. They always take a picture. Most of the crew didn’t drink coffee before starting it together. Now, they all do. And their journey into Boston’s coffee scene has brought out some observations. They got ugly looks at Crema Cafe for taking up too much space. 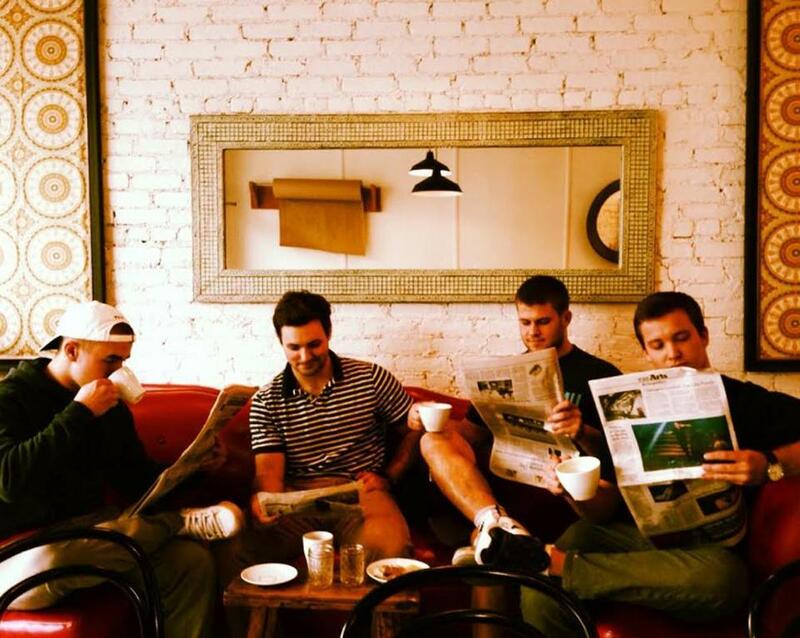 Boston Brewin Coffee turned out to be a curbside stop with no seating so they hung out at a nearby hotel lobby. At Render Coffee in the South End, Burke had coffee spilled on him. They’ve gotten funny looks from their fellow football players, who think their ritual is hilarious. During away games, they don’t have time to venture out to cafes. But during their bowl games, they have. When they planed in the Pinstripe Bowl last year in New York City, they went to Magnolia Bakery. 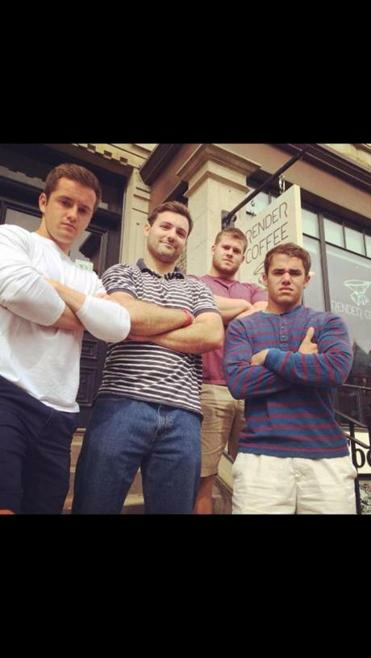 The year before, when they played in the AdvoCare V100 Bowl in Shreveport, La., they found a coffee shop nearby. Some coaches have asked to come along, and they’ve considered bringing faculty. If parents are in town, they have been known to join. But so far, it’s mostly been other students who have been invited. 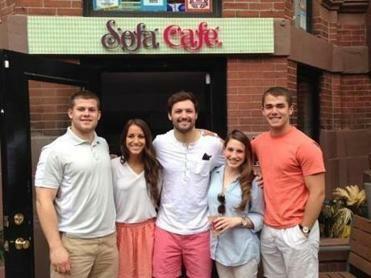 Sean Burke, Alex Obusek (guest), Zach Wolfe, Kellie Mantie (guest), and Joey Launceford at the newly opened Sofá Cafe on Newbury Street in Boston, MA. They have done most shops in Boston and Cambridge, headed up toward Wellesley (to Quebrada Baking Co.). One member of the crew has graduated, and Launceford is about to; the other two will be seniors next year. But everyone is planning to stay in the Boston area, so there are no plans to disband. They’re looking for new shops, and new guests. And with easy access to a car, they can now broaden their trips. “Boston College, a lot of kids don’t really leave campus much. It’s easy to stay here, it’s a fun school. It’s easy to not leave your dorm,” Launceford said. Click here for more from Double Shot.